There is a lot of interest in Christchurch in how communities can be more and better involved in helping revive and remake public spaces, buildings and parks. So how can we facilitate community participation in public space and architecture projects? 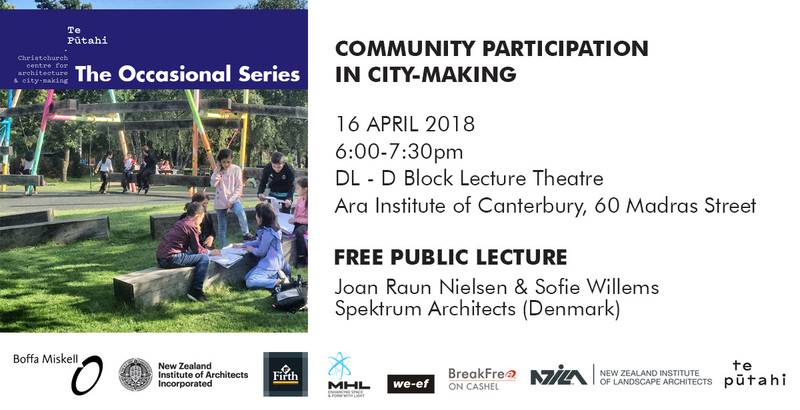 In this free and public lecture, Joan Raun Nielsen and Sofie Willems, award-winning architects from Spektrum Architects (Denmark), present their approach to co-creation and participatory practice, and share some of their superb projects with us. They have worked with a broad range of people, including communities with very limited budgets, and have achieved stunning results through the use of community consultation. Regardless of land ownership or who the client is – be it public, community or private or a mixture – their practice is applicable to a wide range of situations and to a variety of people.